Eden Hazard and Natacha Van Honacker married since 2012. Has couple any child. Eden Hazard is one of the most prolific footballers, who play for Belgian National Team and Chelsea Football Club. If we talk about this year in the Pitch Scoring goals and assisting he is simply sensational. As we all know about him as a Professional Footballer, besides that He was married to Natacha Van Honacker in 2012. Let’s find out about their married Life, children as well as a professional career. Eden Hazard married Natacha Van Honacker in 2012. He is a happily living married man. They are the perfect couple and they look beautiful together. Similarly, they have also been spotted and noticed in several events public places even in the Football Pitch together and in love. Eden Hazard and Natacha Van Honacker at their wedding. Till date, there are no rumors of a divorce between the lovely couple as it seems Hazard is a loyal husband. Though there was a rumor about his affair to one of Chelsea’s doctors Eva Carneiro, it never became an issue for him as well as his wife Natacha. Probably, that was just a rumor. 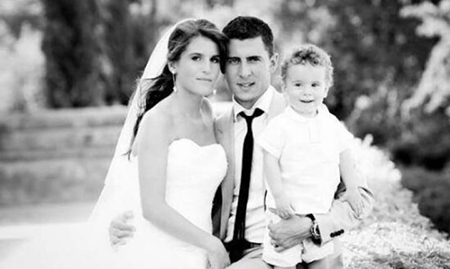 With their 4 years of Successful marriage, the couple has been blessed with three children: Yannis Hazard, Leo Hazard, and Samy Hazard. On 2013, Hazard was in controversy as he was sent off in the Football League Cup semi-final in the second leg against Swansea City for kicking a ball boy. The incident took place just over 10 minutes from time when Hazard lost patience and kicked the ball boy, who is the son of Swansea football club director Martin Morgan. Chelsea went on to lose the tie 2–0. Thereafter, he told media that he and the boy both apologized to each other for the incident. Last season, he once again got surrounded by the controversy, while Swapping the shirt With PSG Winger Angel Di Maria during Halftime, where Chelsea was Knocked out by PSG in Champions League. He was heavily criticized by media and fans , describing as an act of betrayal. A Belgian-born attacking winger and midfielder is known for his speed, technical ability, and creativity on the ground. He has been critically acclaimed for his great vision and his playing style. So, most of the time, media, coaches, and players compare him with to FIFA Ballon d'Or winners Lionel Messi and Cristiano Ronaldo. The Belgian international is ranked as one of the best footballers of the era. He began his football career for his motherland playing for the Local Club Stade Brainois. Eden Hazard playing for Chelsea. In 2005, he joined the French first division club Lille at the age of 14, where he spent almost two years in the club's academy and made his professional debut in November 2007 at the age of 16, where he play the crucial role, winning a Young Player of the year award twice. 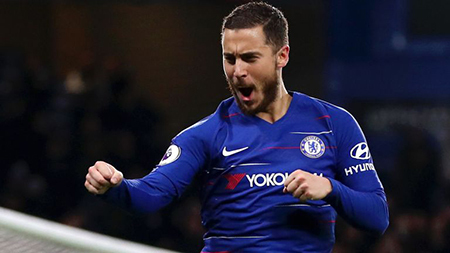 In 2012, spending over eight years at Lille, He signed for English giant Chelsea football Club; where he won UEFA Europa League in his first season and in his second season he became the PFA Young Player of the Year. In the year 2014–15 seasons, he helps out Chelsea to win the Premier League title and the League cup under the Coach Jose Mourinho. He won the FWA Footballer of the Year and the PFA Player of the Year awards in that season. In this 2016/17 season, he is in the extreme form under Coach Antonio Conte and is hopeful to win the title this season.